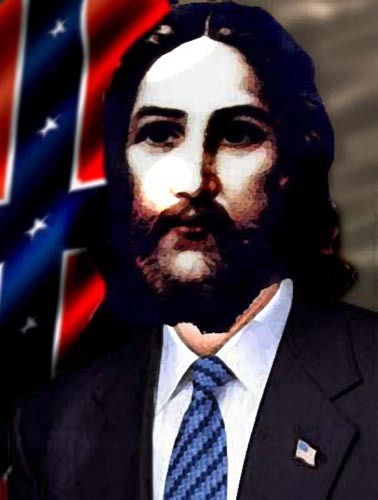 With Representative Michele Bachmann’s victory in the Ames, Iowa straw poll, and Texas Governor Rick Perry’s triumphal entrance into the GOP presidential primary, there’s been a sudden spike of attention drawn to the extremist religious beliefs both candidates have been associated with – up to and including their belief in Christian dominionism. (In the Texas Observer, the New Yorker, and the Daily Beast, for example.) The responses of denial from both the religious right itself and from the centrist Beltway press have been so incongruous as to be laughable – if only the subject matter weren’t so deadly serious. Those responses need to be answered, but more importantly, we need to have the serious discussion they want to prevent. Furthermore, C Porter Wagner, the intellectual godfather of the New Apostolic Reformation (NAR), actually wrote a book called Dominion! in 2007. Chapter Three was entitled “Dominion Theology”. When pressed, Porter likes to pretend that his ideas are just garden-variety Christianity, based on Genesis 1:26, in which, before the fall, God gives Adam and Eve dominion over the natural world – a far cry from dominion over other people, who did not even exist at the time, as evangelical critics of this dominionist argument have repeatedly pointed out. A second source traces back to the roots of the Latter Rain movement of the late 1940s, long rejected by orthodox evangelicals because they contradicted scripture and denied primary agency to God – which is why they insist that Christians must actively establish church dominance over all of society, because God can’t do it alone. The Latter Rain was denounced by the Assemblies of God – the largest American Pentecostal church – in 1949, not solely for dominionist ideology, but for a variety of related beliefs and practices. When similar teachings and practices re-emerged in the guise of the New Apostolic Reformation 50 years later, the Assemblies of God denounced them again in 2000. This time, however, many Assemblies of God congregations have increasingly accepted the NAR influence. Sarah Palin’s long-time church in Wasilla is one such congregation. The most clear-cut example of NAR dominionism is the so-called “Seven Mountains Mandate”, which holds that dominionist Christians should control the whole world by infiltrating and dominating the “Seven Mountains” of culture: (1) Business; (2) Government; (3) Media; (4) Arts and Entertainment; (5) Education; (6) Family; and (7) Religion. However, at the same time Diamond was working on her dissertation – published as the book Spiritual Warfare in 1989 – evangelical writer/researcher Albert James Dager was taking similarly critical aim, though from a different direction. In 1986 and ’87, he published a multi-issue essay “Kingdom Theology” in the publication Media Spotlight. In that text he also used the terms “Kingdom Now” or “Dominion” Theology. In 1990, Dager, too, published a book, Vengeance Is Ours: The Church in Dominion. While his main focus was doctrinal error and non-Christian practices and influences, Dager’s work traced dominionism back to the 1940s and even earlier. Many more have followed in his footsteps since then. If you Google the words “dominionism” and “heresy”, you’ll get more than half a million hits. It should be obvious to anyone that conventional conservative Christians have big problems with dominionism – if only the United States’ establishment media could figure out how to use Google. Despite lingering definitional differences that are common with relatively new terminology, those who study dominionism and related phenomenon in a political framework have an increasingly common and precise terminology that most writers and researchers share. Researcher Chip Berlet of Political Research Associates provided a very useful guide, “The Christian Right, Dominionism, and Theocracy”, which addresses issues of terminology from several different perspectives – for example, between “generic dominionism” and specific dominion theologies. Rushdoony’s Christian Reconstructionists clearly fall into the hard dominionist camp. But the NAR seems to straddle the soft/hard division. On the one hand, they clearly do claim that conservative Christians are ordained to run the world, not just US society. Thus, the Seven Mountains Mandate. On the other hand, Wagner and others have argued that the Seven Mountains is compatible with democracy. The state of Hawaii shows how: Early in the 2010 election cycle, both the Republican and the Democratic frontrunners for governor were associated with the NAR. That changed when long-time Congressman Neil Abercrombie joined the race on the Democratic side, and eventually won the race handily. But for a while, the NAR came tantalisingly close to realising their dream, at least in one state – not just to win power, but to occupy all the possible paths to power. This brings us, finally, to the serious discussions that dominionists and their enablers, like Miller, are trying to prevent. The first of those is about the very nature of American democracy. For nearly 200 years, Europe was torn apart by a series of religious wars and their bloody aftermath – the major reason that the United States was founded as a secular republic. We’re potentially on the verge of forgetting all that history and suffering through it again, just as we’re now suffering through forgetting the lessons of the Great Depression. Those centuries of war began with the German Peasants’ War of 1524-26, in which more than 100,000 died; continued through the 1648 Treaty of Westphalia, which ended the Thirty Years War on the European continent; and lasted until the end of the War of the Spanish Succession (1701–1714). This was the bloody European history of religious intolerance and strife that many, if not most, American colonialists were fleeing from when they came to the New World. It was also this bloody history that gave rise to the development of classical liberalism, affirming the individual right to religious liberty and replacing the top-down theocratic justification of the state with Locke’s concept of the bottom-up social contract, based on the consent of the governed. The ideas that Locke perfected took generations to develop. Religious tolerance, for example, began as simply a matter of pragmatism: unless people stopped killing each other for differing religious beliefs, war in Europe would never end. But gradually, the idea took hold that tolerance was a positive good, and key to this new perspective was the recognition that torturing someone to change their beliefs could not produce the desired result of a genuine heartfelt conversion. Thus, the moral rejection of torture – another feature of classical liberalism – had its roots in the evolution of the idea of religious liberty. The idea of utterly forgetting the prolonged bloody history that the United States was born out of is no laughing matter. The same could be said of the myth that the United States was founded as a Christian nation, with laws based on the Bible. Of course most Americans were Christians at the time, but the leading intellects were decidedly less so, much more influenced by Enlightenment thought. There were many, such as Jefferson, who were better described as Deists, who believed that God had created a rational universe, but did not intervene supernaturally thereafter. They deliberately used terms like “the Creator” and “Nature’s God” to affirm their distinctive, non-Christian view. There are very immediate consequences that flow from the theocratic mindset. You’ll note, for example, that the “Seven Mountains” of culture do not include science. That’s not because dominionists intend to leave science alone, but rather because they see no need to dominate what they can simply cut off, ignore and deny. If science tells them that homosexuality is an inborn trait, why fight that in the realm of science when politics, the media, religion and education offer much, much better places to fight? After all, who says that education has to be based on facts? The same holds true for evolution and global warming as well, not to mention the workings of the economy. Yet the dominionist connection to the Tea Party goes far beyond just the two candidacies of Michele Bachmann and Rick Perry. Ron Paul, whose extreme anti-government positions helped to fuel the emergence of the Tea Party, has much deeper dominionist connections than either of the two new darlings. During his first term in Congress, one of his aides was Gary North, Rushdoony’s son-in-law, and a leading Reconstructionist in his own right, who has written extensively on so-called “Biblical Capitalism”, an ideology profoundly at odds with traditional Biblical-based teachings on economic justice. While libertarians once traced their descent from John Locke, and more recently from the deeply anti-Christian Ayn Rand, Reconstructionism represents an increasingly important foundation for their views. A recently released sociology study, “Cultures of the Tea Party”, found that Tea Party supporters are characterised by four dispositions: “authoritarianism, ontological insecurity, libertarianism, and nativism”. Since traditional libertarianism was purportedly the opposite of authoritarianism, this highlights how radically libertarianism has changed – a conclusion that’s echoed by the 2011 Pew Reaserch Political Typology Poll, which found that religious and economic conservatives had completely merged into one single group since 2006 and all previous polling. What this means in the long run is far from clear. But it strongly suggests a solidfying outlook with deep Reconstructionist sympathies that actually looks at government failure to deal with major issues, such as restoring the economy, as a positive good. If faith in American institutions collapses entirely, then who wouldn’t give Biblical law a shot? The more loudly such people proclaim themselves patriots, the more loudly they cheer for US collapse. It’s not just Obama they want to fail. It’s the very idea of America.